mingle, where children play in the cobbled streets by day and a killer stalks at night, where bright hopes meet the darkest truths. Here, by the whispering waters of the Thames, Fiona Finnegan, a worker in a tea factory, hopes to own a shop one day, together with her lifelong love, Joe Bristow, a costermonger's son. With nothing but their faith in each other to spur them on, Fiona and Joe struggle, save, and sacrifice to achieve their dreams. I became a fan of Jennifer Donnelly after reading Revolution and continued with The Northern Lights. Both books drew me right in and didn't let go until I finished. 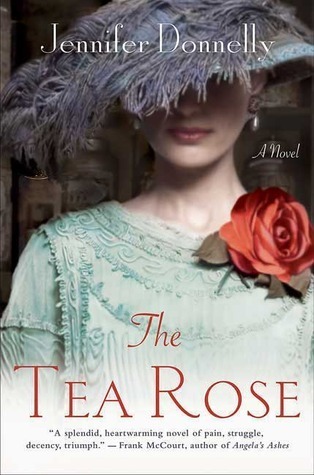 The Tea Rose has been on my TBR pile for so long, but I think the print copy I bought was too intimating. An over sized trade paperback with tiny tiny print is why I went the audio version. Coming in over 28 hours I was a little nervous hoping it would keep my attention all the way. Jill Tanner was the reader and she did a great job. I really enjoyed this book, the author painted a vivid picture of London during the time of Jack the Ripper, though his role isn't predominant, it does have a part. The first couple of hours Donnelly spends times introducing not just the family but what life was like for the lower class. Not just the struggles just to survive but the hopes and dreams of those ambitious enough to think they can overcome so many obstacles. Centering mostly around Fiona it wasn't hard to sympathize and feel for her. Her heartbreak was real as were her dreams. As tragedy forces her to take a stand for herself and little brother she bravely ventures across the ocean to begin life a new in New York. While at times I got the feeling of predictability the author surprised me with twists and turns I didn't see coming. There were a couple things preventing me from giving this book 5 stars, things I won't mention as they would be spoilers. This book has it all, murder, romance, mystery, heartbreak, love and adventure (plus more). The first book in Jennifer Donnelly's The Tea Rose Series, definitely one I highly recommend to those that love getting lost in a doorstopper sized book.